Amorphous and crystalline are two states that describe typical solids in chemistry. Using X-ray diffraction experiments, the structure of solids can be categorized into crystalline or amorphous (non-crystalline). Solids are among the three basic states of matter that include liquids and gases. They are characterized by a rigid structure of molecules, ions and atoms arranged in an orderly or non-orderly manner. These orderly or non-orderly arrangements have led to the categorization as amorphous and crystalline and this article unfolds the key differences between the two terms. 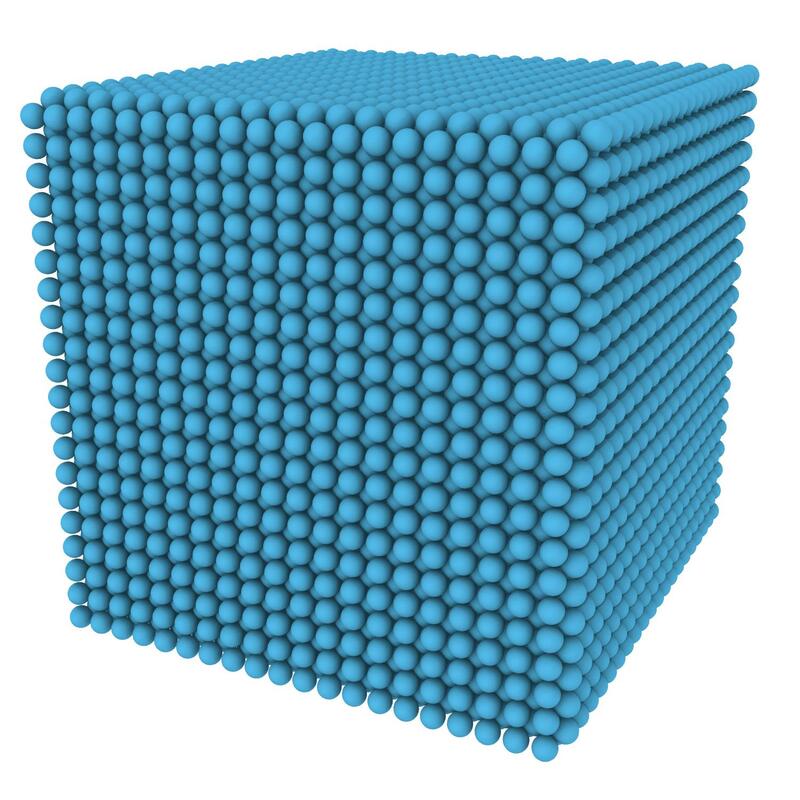 A crystalline solid is that in which the constituent particles are orderly arranged in a three-dimensional pattern called the crystal lattice with uniform intermolecular forces, and the particles intersect at angles characteristic of the crystal. The internal structure has a distinct geometric shape, and it shows a clear cleavage when cut anywhere in the structure. The three dimensional pattern seen using the X-rays is used to identify the solid. It is not, however, easy to detect the difference between crystalline and non-crystalline solids by touching them. They differ from each other in many aspects including chemical and physical properties. Crystalline solids (crystals) need extreme temperatures to break the intermolecular forces. They have a definite heat of fusion and melting points because of the uniform arrangement of their components. The local environment is also uniform. However, when cut in any direction, the physical properties are different thus known as anisotropic. When rotated around the axis, the structure of crystals remains the same and that is termed as symmetrical arrangement of molecules, atoms or ions. Some crystalline solids can end up being amorphous depending on the cooling process. Others may have their components misaligned due to the presence of impurities. Also, cooling substances rapidly may lead to an amorphous structure with irregular geometrical shapes. Quartz, for instance, is crystalline with Silicone and Oxygen atoms in an orderly manner. But, when cooled rapidly, it can lead to the amorphous structure glass. It happens normally that the crystallization process is avoided by melting substances rapidly to produce amorphous solids because of their extensive industrial applications. Rubber, polymer and glass are among the perfect examples of important amorphous solids largely used for their immense benefits and unique isotropic properties. The refractive index, mechanical strength, thermal conductivity and electrical conductivity of crystalline solids differ in different directions. That is the downside of these types of solids compared to non-crystalline solids. The good side of an anisotropic solid is that it denotes a perfectly arranged internal structure with uniform forces of attractions in a crystal lattice. It depicts the true properties of a solid with long range order and a rigid structure. The word amorphous is derived from the Greek word amorphous which means “shapeless”. 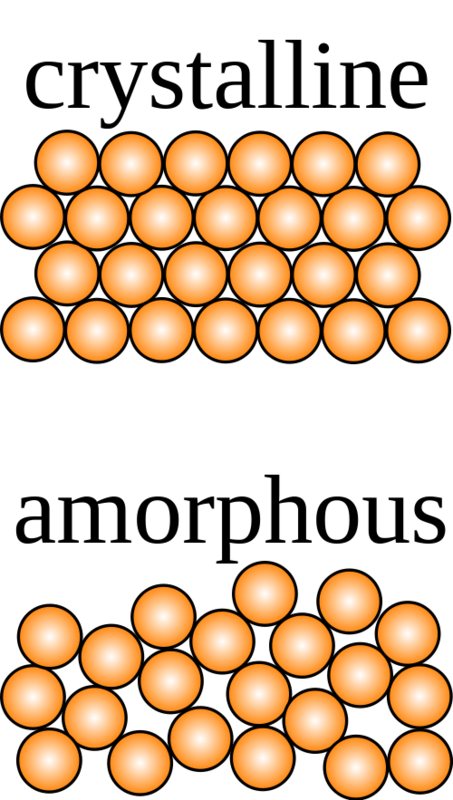 This is the shapeless, disordered, and irregular arrangement of the constituent particles of a solid. Their inter-molecular forces are not the same, nor are the distances between the particles. When cleaved, amorphous solids yield fragments or curved surfaces because of irregular geometric shapes. Some amorphous solids can have parts of orderly arranged patterns which are called crystallites. The atoms, ions or molecules of the solid depend on the cooling process. As aforementioned, quartz crystal differs with quartz glass because of the process of crystallization. But, generally, many amorphous solids have a disordered pattern. They are usually called the super-cooled solids because the structure shares some properties with liquids. Also, they do not show the true properties of solids, but are nonetheless predominantly used in numerous applications. Thermal conductivity, mechanical strength, electrical conductivity and refractive index are the same in all directions of amorphous solids. This explains where the name isotropic comes from. The solids do not have a sharp melting points or a definite heat of fusion. A wide range of temperature needs to be applied before they can melt because of the absence of an ordered array of components. Furthermore, amorphous solids are characterized by a short range order. Examples of amorphous solids include polymers, rubbers, plastics and glass. If an amorphous solid is left for a long time below its melting point, it can transform into a crystalline solid. It can depict the same properties possessed by the crystalline solids. Crystalline solids have a definite shape with orderly arranged ions, molecules or atoms in a three-dimensional pattern often termed crystal lattice. If cut, they depict a clear cleavage with surfaces intersecting at angles that are characteristic of the crystal. Amorphous solids, on the other hand, have a disordered array of components not showing a definite shape. When cut, they show irregular shapes usually with curved surfaces. Crystalline components are held together by uniform intermolecular forces whereas in amorphous solids these forces differ from one atom to the other. Amorphous solids do not have definite melting points but melt over a wide range of temperature because of the irregular shape. Crystalline solids, on the other hand, have a sharp melting point. Crystalline solids possess different electrical conductivity, thermal conductivity, refractive index and mechanical strength within a crystal in different directions hence they are called anisotropic. Amorphous are called isotropic because of similar physical properties from either direction. Examples of a crystalline solid include NaCl, sugar and diamond whereas the examples of amorphous solids include glass, rubber and polymers. Examples of amorphous include glass and that of crystalline include diamond. Lusi Madisha. 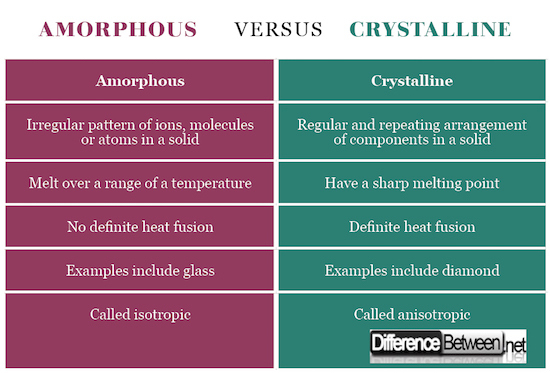 "Difference Between Crystalline and Amorphous." DifferenceBetween.net. April 5, 2018 < http://www.differencebetween.net/science/difference-between-crystalline-and-amorphous/ >. Dolter, T., & Maone, L. J. (2008). Basic Concepts of Chemistry (8th Ed.). John Wiley & Sons.